Congratulation to Valentin Flauraud and co-authors for their recent publication in Nanoletters about Large-scale arrays of Bowtie Nanoaperture Antennas for Nanoscale Dynamics in Living Cell Membranes. We present a novel blurring-free stencil lithography patterning technique for high-throughput fabrication of large-scale arrays of nanoaperture optical antennas. The approach relies on dry etching through nanostencils to achieve reproducible and uniform control of nanoantenna geometries at the nanoscale, over millimeter-sizes in a thin aluminum film. We demonstrate the fabrication of over 400 000 bowtie nanoaperture (BNA) antennas on biocompatible substrates, having gap sizes ranging from (80 ± 5) nm down to (20 ± 10) nm. 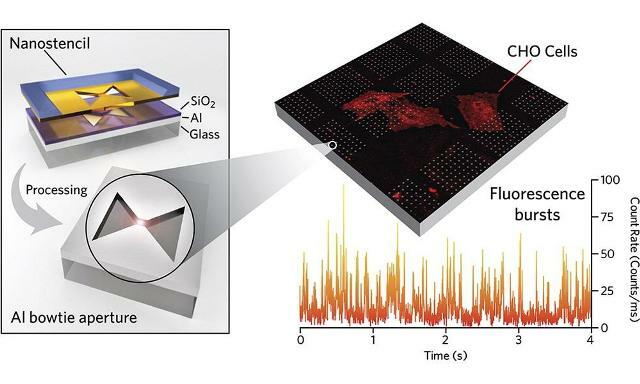 To validate their applicability on live cell research, we used the antenna substrates as hotspots of localized illumination to excite fluorescently labeled lipids on living cell membranes. The high signal-to-background afforded by the BNA arrays allowed the recording of single fluorescent bursts corresponding to the passage of freely diffusing individual lipids through hotspot excitation regions as small as 20 nm. Statistical analysis of burst length and intensity together with simulations demonstrate that the measured signals arise from the ultraconfined excitation region of the antennas. Because these inexpensive antenna arrays are fully biocompatible and amenable to their integration in most fluorescence microscopes, we foresee a large number of applications including the investigation of the plasma membrane of living cells with nanoscale resolution at endogenous expression levels.